The CRT needs an anode to cathode supply voltage of 1000V or more to give a bright and sharp display. The deflection plates which move the dot around the screen must be at about the same voltage as the anode. So if the cathode is at or near ground potential as is common in vacuum tube circuits, then the deflection plates are 1KV above ground. If the deflection plates are to be driven by a DC coupled transistor amplifier, and the bases are to be near ground so that they may in turn be driven by low voltage circuits then the output transistors must have a VCEOrating of over 1KV. Transistors with that kind of collector breakdown voltage that are also fast enough to handle megahertz signals are rare indeed. 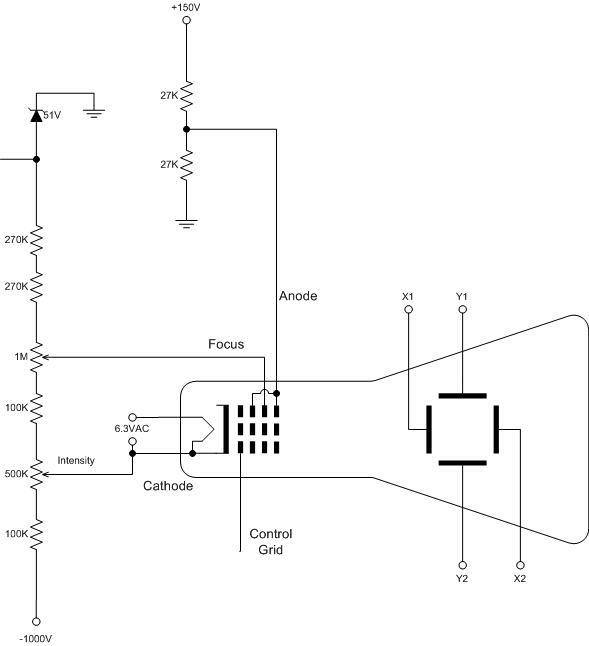 If, on the contrary, the anode voltage is at ground, then we would need an amplifier with an output stage that could swing 60 or so volts above and below ground. While this is possible, it would be more complex than necessary. A better solution is to put the CRT anode 70 to 80 volts above (more positive than) ground and the cathode about 950 volts below ground. In this way, the drivers for the deflection plates could work from a 150 Volt supply and swing ±60 Volts from a quiescent value of about 75 Volts. In the drawing above, the two 27K resistors set the anode potential to 75V. The second and fourth grids are internally connected to the anode and along with the third or focus grid form a lens that focuses the electron beam from the cathode to a small sharp dot on the screen. The control grid is held near -1000V by circuitry not shown here. The voltage divider on the left of the drawing provides proper bias voltage for the focus grid and the cathode. The top pot adjusts focus and the lower one sets the brightness of the dot on the screen.